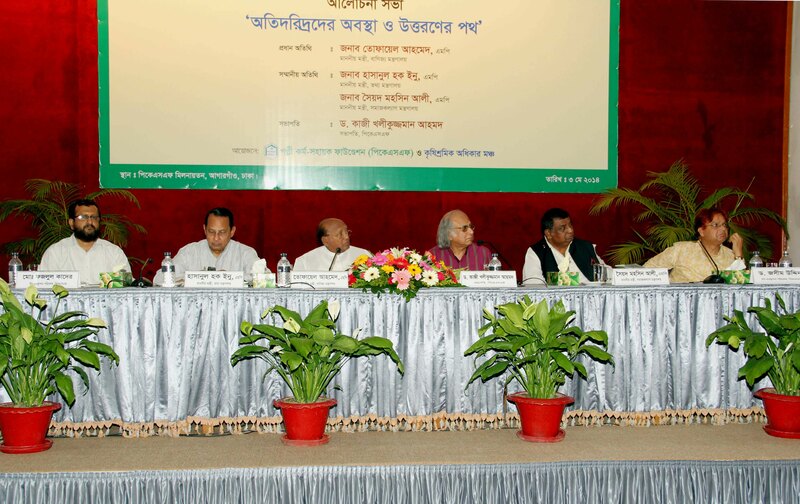 May 3, 2014, PKSF Bhaban: PKSF and the Agriculture Labourers’ Rights Forum hosted a seminar on the Ultra-Poor: Their Current Situation and the Path Forward, discussing the situation of the ultra-poor in today’s economy, the need to restore them to functioning and contributing members of society, and the necessary steps required to bring them out of the low productivity trap and ensure sustainable livelihoods for them. PKSF’s Chairman further urged other development organizations, both public and private, to get involved in this endeavor, and reassured the ultra-poor guests present to not lose hope. 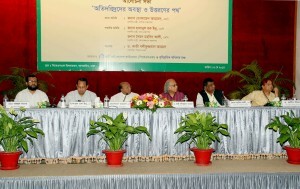 Commerce Minister Mr. Tofail Ahmed, MP attended the occasion as the Chief Guest. Also present were the Information Minister, Mr. Hasanul Haq Inu, MP and Social Welfare Minister, Mr. Syed Mohsin Ali, MP. The ultra-poor have faced self, social and institutional exclusion in Bangladesh due to lack of confidence and lack of access to the right resources. In 2002, PKSF designed a microcredit programme custom-fit to the needs of the ultra-poor, featuring low interest rates and flexible repayment methods. The programme reaches the many ultra-poor living in coastal regions, haor, char, draught and flood prone, and economically backward areas.